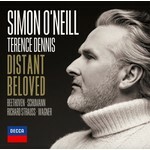 "The inspiration for this recording of German lieder is distance. Travel plays a significant part in the life of any opera singer, and, whilst I am privileged to have the opportunity to sing Siegmund, Siegfried, Parsifal and many other dream roles in the great opera houses and concert halls of the world, my career takes me away from home and loved ones for over nine months each year. Such is the singer's lot. The title of this album is deeply evocative for me. Though I may be performing on the opposite side of the world, my thoughts are never far from my beautiful wife and children, and our wonderful family home in New Zealand, overlooking endless majesty of the Pacific Ocean. I began my musical life in New Zealand as a pianist and brass player, before embarking upon my vocal studies as a lieder baritone. Schubert and Schumann featured heavily in this early period of my vocal training. Further study at the Manhattan School of Music and the Juilliard School in New York, saw me develop into a young lirico-spinto tenor. It was around that time that I first heard Fritz Wunderlich's 1963 lieder album (on the Philips label), pairing An die ferne Geliebte with some of the same Richard Strauss songs which appear on this album. 'Distant Beloved' is something of a tribute to that album, and to Wunderlich himself, who was, for me, the greatest lieder tenor of all. Since those early days, much has changed in my singing life. Travel has taken me ever further from home, and time and experience have seen my voice graduate from that earlier lirico-spinto repertoire into the more dramatic, heroic repertoire of Wagner and Strauss. Throughout that long journey, I never stopped singing these magnificent songs. It brings me great joy and satisfaction to sit at the piano, playing and singing them.